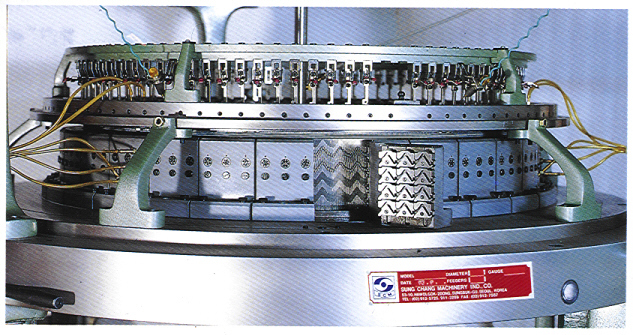 This model is the most productive single Jersey circular Knitting machine incorporating new body frame, new designed driving system, Computer designed solid type Cam giving high quality single Jersey fabrics at high production and efficiency rates with minimum operative coats. Cylinder cams for machines with 2 to 4 cam tracks, 3 position select available by changing cams. 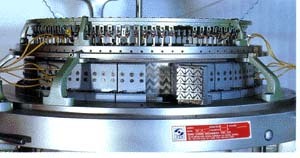 For single jersey machines, when machine is ordered with 4 cam tracks in the cylinder, 4 knit cams, 1 tuck and 1 welt cams are supplied with the machine as standard per feed. Healy wire race bearings for high running accuracy with lower friction and starting torque. Side creel stand for corn of yarn. Take-up: Designed for high drive. Lubrication system: Oil mist Lubrication for needles, cams and sinkers with dust blower. Cylinder and Sinker dial made of super quality tempered steel. If you want to get details of the machine please click the below arrow button.